Think of this race as the Iditarod or Tour de France — but on horseback. About half the riders reached the final day. Some dropped out because of dehydration. One broke his collarbone and shoulder in Dodge City when his horse reared. Event organizer Rob Phillips worked 18 months to put it together. Was it everything he had hoped? He was quick to say it was not. Two horses were killed and their riders injured when they were hit by a car south of Canton, Kan., on the ninth day. One of the injured riders, Teresa Wilcox of Chadwick, Mo., returned Saturday and rode a 15-mile leg. Phillips said some riders often walked miles to rest their horses. Water troughs were spaced every five miles. Rick Lee, a rider from Adams, Neb., said wearing the right clothes was important, especially for riders spending hours in the saddle. A rider wearing just a pair of jeans would finish the day with badly battered legs. To increase protection, he said, many riders wore pantyhose or bicycle pants underneath their jeans. Kept close by, he added, were jars of skin ointment. @ Go to KansasCity.com for video. To reach Jim Sullinger, call 816-234-7701 or send e-mail to jsullinger@kcstar.com. GARDNER, Kan. (AP) -- Jim Hole was among the riders in the Great Santa Fe Horse Race finishing the 515-mile endurance ride this weekend in a town where pioneers had to decide which route to take on their westward journey. The race started Sept. 3 near the Santa Fe National Forest in New Mexico, going more or less along the wide, meandering trail that opened in 1821 as a trade route between Santa Fe, then part of Mexico, and its starting point in Independence, Mo. Hole, of Sacramento, Calif., was one of two riders Friday who had made the entire trip on one horse, even though the rules allow for multiple horses. Since the start, Hole's constant companion has been Little Big Man, an 8-year-old bay Arabian gelding he calls his "friend and partner." "Sometimes you have to experience what they went through to appreciate what you've got today," Hole said. "You feel the wind on your shoulders, the smells, hear the birds. It takes you back to another day." That's something Rob Phillips, founder and coordinator of the race, had in mind when he came up with the idea a year and half ago. "We wanted them to get the feel for the terrain, and I think they are getting a good feel for that, but you can never replicate how it was in the 1800s," said Phillips, of Lawrence. He said the race started with 60 riders. That's been pared to 45 or 50 as the race entered its final days. On Friday, 21 riders competed at Eisenhower State Park near Melvern Lake in Osage County. Phillips said the park was used because it had riding trails. They rode an 18-mile circuit three times to get in their miles before setting up camp outside Gardner. "They're out here to see what they can do. They don't have to ride every day," said ride manager Marilyn McCoy, of Sierra Vista, Ariz.
On Saturday, riders will repeat the process at Hillsdale Lake to the finish the race, then return to Gardner to find out how they fared. Originally, the race was to end in Independence, Mo., but the proliferation of highways, streets, subdivisions and businesses between here and there ruled that out. "The more we looked, it wasn't feasible because of the traffic. We just couldn't do that part," Phillips said. "The lakes have riding trails where we can do 50 miles on them and they are near the Santa Fe Trail." The competition had at least a dozen categories, and the overall winner will be the rider with the shortest time. Phillips originally envisioned an 800-mile dash for the cash. But the distance was reduced for the sake of horses and riders, and cash prizes were eliminated so the event could be sanctioned by the American Endurance Ride Conference, the national governing body. "We didn't want the people riding the horses so hard just to win a dollar, but they'll still get bragging rights for the rest of their lives," Phillips said. Friday was a day of gentle winds, making the prairie grass and sunflowers wave and temperatures in the 60s. Susan Thompson, of Sweetwater, Tenn., took a scheduled break while her horse, a 7-year-old brown Arabian gelding named Thee Macade was being checked by veterinarians -- one of four vet checks each horse undergoes each day. "They can't tell you when they don't feel good, or are hungry or thirsty," she said. Phillips' inspiration for the race came after hearing about Francis X. Aubry, a trader who made a $1,000 bet in 1848 that he could travel the trail from Santa Fe to Independence in six days. He took five days and 16 hours to cover the 800-mile route that normally took a month, establishing a record that still stands. While this is the first year for such an event, Phillips said, "We have a vision that this will become one of the major equine events in our country." "The original settlers were blacksmiths and suppliers for people on the trail. This was the last stop before deciding whether to the Santa Fe, Oregon or California trails," said Chamber of Commerce President Peter Solie. The three trails were one coming out of Independence through Gardner. Then west of town, the Santa Fe went southwest, mainly as a two-way trade route, and the Oregon settlers' route split to the northwest. The California Trail then parted from the Oregon in southern Idaho. The American Endurance Ride Conference (AERC) will investigate the deaths of the two horses that were hit by a car after crossing the finish line on day seven of the Great Santa Fe Trail Horse Ride, said AERC President Mike Maul. The investigation will be conducted independently of the insurance investigation into the incident. "This is a terrible thing that has happened," said Maul. "My heart goes out to the riders who were injured. I am so glad to hear that they are back at the ride site." "An incident such as this during the ride or at the finish has never happened before in the 35-year history of AERC," said Maul. "All incidents, whether large or small, are investigated by the AERC with the purpose of making the sport safer for both riders and the horses participating in the event." "AERC sanctioning provides a uniform standard for those rides, which are put on by members of the AERC as ride managers," said Maul. "The ride itself is supervised by the ride manager and is not under the supervision of the AERC." The Great Santa Fe Trail Horse Race is an 800-mile endurance ride completed over a 13-day period. The ride started in Santa Fe, N.M., on Sept. 3 and will end in Missouri on Sept. 15. One of the main objectives of the race is to educate the public not only on the national historic Santa Fe Trail, but also to introduce the sport of endurance riding to thousands, said Maul. COOL - Competing a few miles down the road from the Pilot Hill residence, the Bakewell family made itself at home during last weekend's Cool Ride and Tie. The Olmstead Loop in Cool hosted the second annual event, making it a short trip for local competitors and they took full advantage. While Scott and Tracy Bakewell raced to first place in the 13-mile event, renowned endurance athletes Tom Johnson and Marcia Smith of Loomis, took the top prize in the 22-mile race. Ride and tie involves two runners and one horse per team. All three team members must cross the finish line and the team must make a minimum of six exchanges between rider and runner throughout the race. "I love the mix of endurance running and horses," said Tracy Bakewell, took a 15-year break from the sport before returning this year. "I'm very passionate about both and I thought it was unbelievable that a sport like this existed. My husband wasn't into it at all, but he went to a few, got the feel for it and now we can turn it into a family camping weekend adventure." Emily Bakewell, 8, even got into the action in Cool. She and her mother competed in the four-mile race Saturday afternoon, riding Emily's mustang Rudy. "She'd wanted to do one for awhile," Tracy explained. "I was really happy they offered an event afterward for the younger riders." Rufus Schneider and Nita Browning rode Koona to first place in the four-mile race. In the nine-mile division, Madelynn Jordan and Bill Bordan were winners, atop Torche. The Cool Ride and Tie was an immediate hit with the endurance community after Cool's Frank Lieberman introduced it last year. 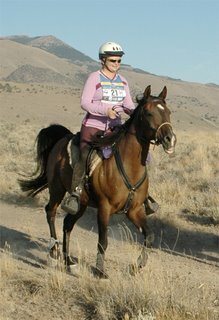 A former Tevis Cup and Western States Endurance Run finisher, Lieberman has been involved with ride and tie for many years and thought a local event would only be appropriate. "We had talked about it for years," said Lieberman, whose wife Linda also played a key role in organizing the event. "The setting here is perfect for it, so we finally just decided to go ahead and do it." The event is one of 24 races throughout the country sanctioned by the Ride and Tie Association. It also serves as a fundraiser for the Michael Gray Trust. Gray, who owned the Cool Feed Store, had been a supporter of the inaugural race before suffering a fatal stroke. Last year's proceeds went to the Gray family, while this year's proceeds went to the family of former ride and tie competitor Jeremy Davis, who passed away in July. Lieberman said 37 teams competed on Saturday as a group of 37 volunteers made sure the event ran smoothly. "It was one of the bigger turnouts for an event like this that I've seen," said Bakewell, who owns Personalize It, an engraving business. "Having it close to home, we definitely had more support from friends. And we had a chance to promote the sport to some of our friends." horse all the days. Karen has nearly 9,000 endurance miles nd is on the Pac North Outlaws team with jim and Cindy Brown and Linda Tribby. Bio on the page below. Teresa Wilcox has been back in camp since Wednesday. Sandy Olson is still in the hospital in traction. near the day's finish line near Canton, Kan.
p.m. but rode past the finish line, apparently still racing. horses, killing the animals instantly. they got caught up in the whole thing or what," Johnston said. injuries to the pelvic area and legs," Johnston said. later released, The McPherson Sentinel reported. 50 miles per day. There are three idle days. their horses between crossing the finish line and reaching the paved road. would also evaluate the incident. the organizers' part," Latta said. appeared to be a top priority for organizers. on a "straight through" section of road and unable to avoid the animals. half-mile away from the finish line, Johnston added. CANTON -- An accident at 1:58 p.m. Tuesday marred the Great Santa Fe Trail Horse Race traveling through McPherson County. The accident at 27th Avenue and Cimarron Road seven miles south of Canton. A vehicle struck two horses and two women riders were airlifted to Wichita after sustaining apparent disabling injuries, according to the McPherson County sheriff's department. The driver of the vehicle was transported to McPherson Memorial Hospital, according to officials. Eyewitnesses reported the women riders apparently went past the finish line and into the path of a vehicle moving northbound to Canton. The McPherson County sheriff's department, Canton fire and EMS personnel and Moundridge EMS were dispatched to the accident. The riders followed a route from Dakota Road to Fifth Avenue, to Cimarron Road across McPherson County Tuesday. The Great Santa Fe Trail Horse Race involved more than 60 riders who started in Santa Fe, N.M.. They ride more than 50 miles a day along the Santa Fe Trail until they reach Independence, Mo. Saturday. The actual riding distance is 515 miles while the distance traveled is 800 miles. Where to start-how about near the beginning to set the "stage" for why this accomplishment meant SO much to me. I have my first endurance horse still with me, AW Habod, he is now 26 and enjoying a leisurely lifestyle. Habod "self retired" at 12 or 13 when he broke a coffin bone at home in his field (of rocks). The coffin bone healed fine but he ended up with a secondary issue of low ringbone which ended any distance career. At this time he was at 2665 AERC miles, and it was heartbreaking to know we would never reach that major 3000 mile victory. DA Antar Shalou, born 4-19-91, a big bay Al Khamsa & Egyptian Arabian gelding, this is the horse of a lifetime. He just passed the 3000 mile mark at the Old Selam ride on day two. I have had two such "once in a lifetime" horses, how lucky is that!?! Tempo, as he is called, was bred by Bob and Sheila Harmon of Destiny Arabians here in Eagle Idaho. Bob and Arlene Morris had acquired the unbroken 8 year old gelding, and Bob made Tempo (known as Phylite at the time) his personal riding horse. After a year of searching for a horse, I got a call from Morris' to come take a look at what they had. Well, ONE ride on "Phylite" was all it took, I knew THIS was to be my next soul-mate. After vetting him out, I changed his name to "Tempo" and we began our lives together. Tempo began doing 50's at age 11, with me as his jockey, he was a LOT of horse, he "tried" really hard to be good, which encouraged me to keep working at him. The ONLY time he was so much horse was at endurance rides. I remember them making sure to clear a take-off strip for us at the out-vet holds, as once I started my leg up he was taking out EVERYTHING in his path! It was not only embarrassing, it was down right dangerous, we just had to really pay attention when it was time to mount up. Man I sure do NOT miss those days! Today he is mostly well behaved and a great pleasure-most of the time. Tempo loves life, loves riding, is very expressive and has spent most of those 3015 miles with his lips flapping all over the place. I have more pictures of the inside of that horse's lower lip then I care to think about...ARGH! He is opinionated, loving, independent, generous, kind, grouchy, strong, gentle, can be patient to a fault or impatient to a fault, but he always likes to "go for a ride". He loves having a horse follow him as he IS a leader. Tempo is just a fun horse to be owned by and he makes friends everywhere he goes! There is no place I like better, then sitting next to him at the trailer. He LIKES me and he lets me know it, he wants me to be with him, yet he won't hesitate to leave my hind-end on the trail if he takes a notion to and I have dropped the reins. He just walks off, his eyes glaze over and he heads off to his own "walk-about". You can NOT get him to follow a horse, catch him from a horse, or come back to a horse or group of horses. Tempo doesn't "need" anybody so catching him comes down to either he decides to come back, or he decides he has gone far enough. I hope he continues with all his little quirks for 2-3000 more miles. If his body is willing I am betting his mind and heart will be right there. Tempo is the kind of horse that people notice, he is big, bold, and "weird". This horse is a friend to me, I can NOT imagine for one moment not having him in my life. I try my best to do right by him, to allow him to enjoy what he does yet temper it. Now with the 3K behind us maybe I will relax and let Tempo pick a couple rides to just have his way (well with-in my judgment) and go have some fun. He LOVES to go fast, he does a nice job of it too with much "tempering" on my part. Endurance rides are Tempo's greatest joy in life, although so often times he is SET on going any way BUT the way the other horses went. I for the life of me will never understand him, and I will NEVER, EVER trust him to get me "home" if we get lost! He would get me home, just might not be for several days, after he has seen all he wanted to see. Very frustrating guy, the thought of riding in the dark alone on a ride is terrifying, there HAS to be more then enough glow sticks, we might never get back otherwise! Tempo has a very odd sense of humor. Tempo has given to me what fate took away when Habod got hurt. I've waited a lifetime to get a horse to this pinnacle. Tempo and I ARE a team, we are joined at the hip-well unless he goes on a "walk-about". I like having him in my life, as does he like having me in his. I pray that we continue this partnership for many more years. Trotting out on a long-legged quarter horse named Nugget and wearing a black felt cowboy hat with cut-off jeans, Dawson Higgins didn’t look like a typical endurance rider. But the Tucumcari resident was the quintessential picture of cowboy New Mexico as he rode the first leg of the 515-mile, 15-day Great Santa Fe Trail Horse Race. The race ends Sept. 15 in Independence, Mo. A total of 40 riders began the ride from Country Road 51 at Glorieta/Rowe Mesa about 7:30 a.m. Monday. The ride finished for the day almost 50 miles later near Ribera. The first two riders to finish the day rode Arabians equipped with light-weight endurance saddles, similar to English saddles, carrying water bottles and other gear typical of endurance riders. First in was Scott Griffin of Seattle, on Cruiser, followed closely by Tennessee Lane Mahoney, a newlywed and horse-trainer from Windsor, Colo., on Sabella. Both riders intend to ride their horses the entire distance. Dawson held his own, coming in third. His teammate, Shawn Davis, 39, will ride the 50 miles to Springer today. The Tucumcari duo are the only all-New Mexico team in the race. The first day was likely the toughest of the two-week event, according to riders and race organizers. Veterinarians checked horses before the race began, at two stops during the day’s ride and at the end. Any horse whose heart rate didn’t reach 60 beats per minute within 10 minutes or who showed signs of dehydration or injury were pulled from the race. Similar vet checks will occur each day of the event under rules set by the American Endurance Racing Conference. The first leg Monday covered 14 miles and went up the mesa along a power-line road and over to N.M. 34 on top of the mesa. The next leg was 28 miles across the mesa and down “one long rock” as a rider described it, before reaching the second stop near Ribera. The last leg of the day’s race was a short six-mile hop across the Pecos River. Riders and horses were picked up there by their crews and driven in to Las Vegas, N.M., where they will stay at the mobile Race Village. Riders with many levels of experience in all kinds of gear and riding several different breeds of horses began the first day of the inaugural event. Mac McSwain, a cowboy out of Winona, Texas, intends to ride the whole distance switching off between six Spanish mustangs. He wanted to do the race “so the world can see these are great little horses,” McSwain said. He had a newly purchased equine heart monitor and a global positioning system unit, but “I don’t know how to use either one,” he said with a laugh as he waited his turn for a vet check. Jonathan Jordan, a rider from Alpine, Calif., wore running shoes. "I like to run," said Jordan, an experienced endurance rider. "It gives tHe horse a break. I ride about 10 miles and then get off and run about two miles." Paul Strick of Pierce City, Mo., at 69 is the oldest rider in the event. He’s riding two Arabian/quarter-horse brothers and will attempt the entire distance at a leisurely pace. “Some of these riders will go 9 to 10 mph. I’ll go about 4. I want to go home with these horses healthy. If I don’t, my wife is liable to divorce me or kill me." A cadre of volunteers, also from across the country, are helping check horses in, haul water to rubber tanks placed every five or six miles and try to keep the chaotic event running smoothly. Minnesotan Craig Opel volunteered for another reason. Along the way, he’s dropping by points along the historic Santa Fe Trail where his great-great-great-uncle and aunt stopped in 1850 as they came across by wagon train. His ancestor Anna Maria Morris kept a diary of the trip, and it was published in the book, Cover Wagon Women - Diaries and Letters from the Western Trails. "I came on this to find as many spots where they stopped as I can," Opel said. He took a brief detour during the race to the crumbling adobe church at the Pecos National Historic Park. "I stood exactly where she stood 157 years and 15 days ago,” Opel said. "It was pretty cool." Contact Staci Matlock at 470-9843 or smatlock@sfnewmexican.com. Sept. 3 — Las Vegas, N.M.
Sept. 6-7 — Elkhart, Kan.
Sept. 8 — Dodge City, Kan.
Sept. 9 — Larned, Kan.
Sept. 10 — Lyons, Kan.
Sept. 11-12 — Council Grove, Kan.
Sept. 13 — Burlingame, Kan.
Sept. 14 — Gardner, Kan.
Sept. 15 — Independence, Mo. For more information on the race, visit www.sfthorserace.com.